... passed the first round of elimination of American Idol Season 7. Yeah!!! Actually, she had a pretty good chance of staying because she was one of the few who got good reviews/comments from all 3 judges. But we know that the judges can only do so much [we think] at this time. Their vote of confidence to the contestants can sometimes help but there were a few times when it seemed to have hurt the contestant. 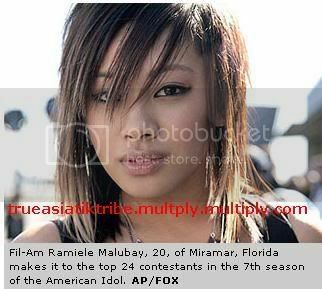 It's just good to know that Ramiele Malubay is staying for another week.